Looking for a strong, robust, no nonsense sewing machine ? then look no further then the Pfaff Select 3.0 and 4.0.With Pfaff original IDT feed system ( Absolutely even fabric feed from both top and bottom ) Rotary sewing hook ( for precise stitching ) high presser foot clearance, 40 stitches and auto buttonhole, this is the sewing machine to buy. From fine silk to 12 layers of denim to stretch velvet the Pfaff select can handle the lot ! . 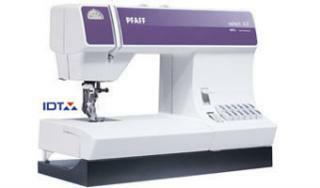 If the Pfaff Select can not sew it no other domestic sewing machine can. Limitations on Relief – In no event shall Pfaff be liable for incidental or consequential damages. Any implied warranty including the implied warranty of merchantability and fitness for any purchase is limited to the duration of the limited warranty.